Unlike every other Christian practice, communion is meant to be done togetheras the Gospel of Matthew tells us, where two or three “gathered in my name.” You simply can’t do it by yourself. You can pray alone and fast alone. You can even go on pilgrimage alone. Communion, on the other hand, forces us to be with others. But like these other practices, communion has the same intention: to gradually move us out of one place and into another. Author Nora Gallagher says it’s like taking a journey to a foreign land, and she divides the trip into three parts: waiting, receiving, and afterward. While we wait, we sort through our baggage, filled with worry, guilt, anxiety, and pain. 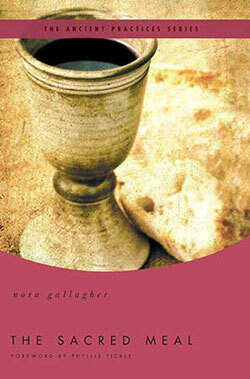 Communion teaches us how to receivethat God’s gift of grace comes to us by doing nothing. Finally, we surrender our invisible baggage and, now lightened, are free to reflect upon and understand the journey we have shared. Gallagher writes,“Every time it is the same, and every time it is different.” This is your family, your table, and act of communitythe gathering of the body of Christ.  Barbara Brown Taylor, author of "Leaving Church" and "Feasting on the Word"
 Lauren F. Winner, Duke Divinity School, author of "Girl Meets God"
 Tony Jones, author of "The New Christians" and "The Sacred Way"